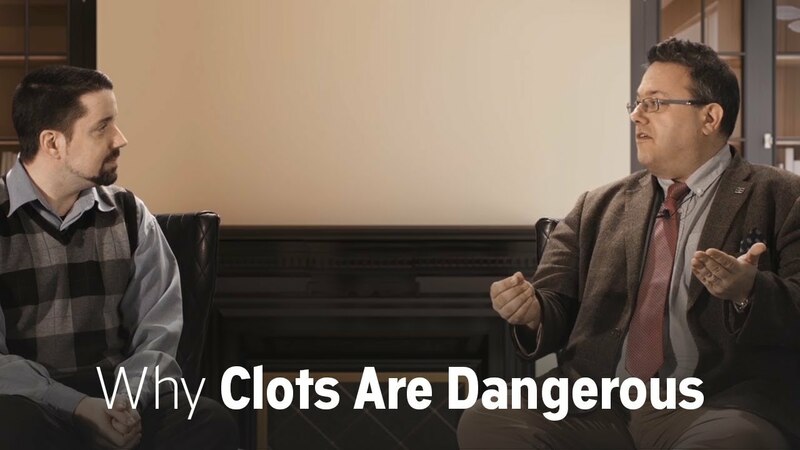 As Prof. Simon Noble, MD, explains, cancer can release molecules that make cancer patients’ blood more sticky and more likely to develop a clot, often in the leg (called deep vein thrombosis). As a clot gets bigger and blocks blood flow in the veins, it can cause pain and swelling. Think of the clot like the cars that pile up after a crash on the freeway. Other cars cannot get through because all these cars — the clot — are stopping traffic. Over time, as more cars try to join the freeway, it gets really crowded. All the roads feeding into the highway get backed up. When a patient gets medicine to treat a clot, it is like freeing up one lane of the highway, then another. But since there is still a backlog, there is swelling. If you did not clear that highway, the whole place would come to a standstill, and it would be very dangerous. In the human body, a piece of a clot in the leg can break off, travel in the bloodstream to the lung and get stuck in a lung artery, causing what is called a pulmonary embolism. When this happens, part of the lung is not able to oxygenate the blood. This can make you breathless and, depending on the size of the clot, it could threaten your life.